Since the U.S. Navy closed the historic Philadelphia Naval Shipyard (PNSY) complex, the Navy Yard has reemerged as a magnet for new businesses, employment, and investment in Philadelphia. Philadelphia is known throughout the world as the birthplace of American democracy. Visitors come by the millions each year to walk the streets and see the buildings where Franklin, Jefferson, and many others debated the founding principles of the United States. Both the Declaration of Independence and the Constitution of the United States were signed in Philadelphia (in what is now known as Independence Hall), and the city served as the nation’s first capital from the Revolutionary War through 1800. Few of Philadelphia’s visitors are likely aware that the city is also the birthplace of the U.S. Navy. Dating back to the founding of the country in 1776, the Continental Congress leased land along Philadelphia’s Front Street docks to support naval defense. On March 27, 1794, President George Washington signed the Naval Act, which called for the purchase of six frigates to defend the country. Built in a shipyard below Carpenter Street in Philadelphia’s Southwark neighborhood, the first of the commissioned ships launched from a private shipyard on May 10, 1797. Shortly thereafter, this shipyard became an official part of the United States Navy, after the Navy purchased its first piece of real estate along the Delaware River, establishing the Southwark Yard between Federal and Reed Streets in 1801. The Southwark Yard remained active for much of the 19th century, serving the country as a production center during the War of 1812 and through the Civil War. More than 50,000 Philadelphians watched the first warship launch from Southwark: the wooden-hulled Franklin. 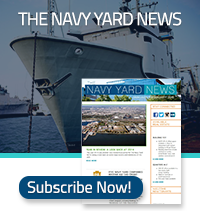 New technology allowing ironclad ships changed the production process, necessitating changes at the Southwark Yard to keep it competitive with newer facilities in Massachusetts and Virginia. Investments in floating dry docks (the first in the world) extended the yard’s useful life, but eventually it became clear that Philadelphia would need an entirely new shipyard. The City of Philadelphia transferred 923-acre League Island to the U.S. Government in 1868 for $1. Funding came slowly in the wake of the Civil War, but the first buildings began to rise in the 1870s. After eight years of running two shipyards, Southwark closed in 1876. The Philadelphia Naval Shipyard (PNSY) continued to operate as a naval base until 1996, employing more than 40,000 people during its peak production period in World War II. During that time, 53 warships were constructed, and an additional 1,218 were repaired. The year 1970 saw the completion of the Blue Ridge, the last new ship to be built at the Yard. Rumors of closure persisted in the decades following, becoming reality when the Base Realignment and Closure Commission (BRAC) made the decision to cease operations in 1991. A court challenge postponed the inevitable for several years, and in the interim the USS John F. Kennedy received a two year overhaul at the PNSY (this would become its final assignment). The Philadelphia Naval Shipyard closed on September 26, 1996. The Navy Yard is a great American landmark that has been transformed into the most successful commercial redevelopment of a former military facility anywhere in the country. In 2000, PIDC acquired control of the Navy Yard on behalf of the City of Philadelphia and the Philadelphia Authority for Industrial Development (PAID), where more than $150 million in publicly funded infrastructure improvements has leveraged in excess of $750 million of private investment. Today, the Navy Yard is a thriving, 1,200-acre business community where 150 companies occupy over 7.5 million square feet of office, industrial/manufacturing, and research and development space. The U.S. Navy’s Naval Ship Systems Engineering Station (NAVSSES), the Propeller Shop and Foundry, and the Naval Inactive Ship Maintenance Facility remain in operations at the Navy Yard.